Back in the summer I did some work on mapping the American commute, which was picked up by WIRED and a few others online. This just proves how much some people like animated gifs but it also demonstrates that it can be a good way to show otherwise complex commuting relations between big cities and their commutersheds. I always meant to come back to it and look at patterns in the Northeastern US more closely, so I decided to finish it off this weekend whilst that part of the world is under a giant blanket of snow and most people aren't going anywhere fast. The real inspiration for looking at all of this, of course, comes from Jean Gottman's Megalopolis, which describes the massive metropolis stretching roughly from Boston in the north to Washington in the south and taking in over 50 million people. That's enough words already, so take a look at the first animated gif and read on... (click any image to see it full size). Now, I love a good animated gif as much as the next person, but there's more to it than that - I promise. 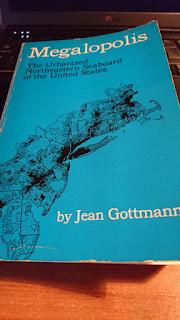 I'm really interested here in the extent to which the cities of Gottman's Megalopolis are actually connected from a functional point of view. I've already written a working paper on it, which you can read if you're really keen, or a related blog post if you prefer. Of course we can simply look at some Census data and see who goes where, but that's harder to fathom at such a vast scale. That's where this Census tract-level data from the American Community Survey comes in useful. I had to patch it all together myself but if you're interested I also made it available for download because I like to share. There are all kinds of crazy commutes in the original dataset, including people who appear to live on the other side of the country but work in New York. You can see this in the next gif, and even more clearly in one still I extracted from it where the shape of the continental US comes out clearly. Some super-long distance commutes - but not on a daily basis! If you pause the animation just a frame or two before all points collapse in on Manhattan, you can see the shape of the US from the dots alone. This is an artefact of the way I've created the animations but it's also an interesting insight into the data - and potentially its validity. But also bear in mind the increasingly complex and long-distance live-work patterns now in existence, as documented in this Quartz piece from October 2015. For personal insights on bicoastal commutes, see this thread on flyertalk! America in one city? Well, not quite, but there is something to this. 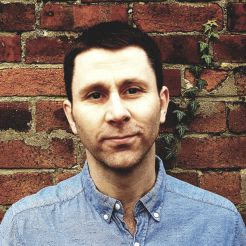 There are loads of good resources online about this kind of stuff, but not much that demonstrates what the patterns look like, hence my post today. However, three resources worth a closer look are the Federal Highway Administration's Megaregions piece, a Working Paper on Mega Commuters in the US by Melanie A. Rapino and Alison K. Fields of the US Census Bureau, and the Regional Plan Association's America 2050 megareions project and maps. But I'm guessing it's already time for another animated gif so here goes... 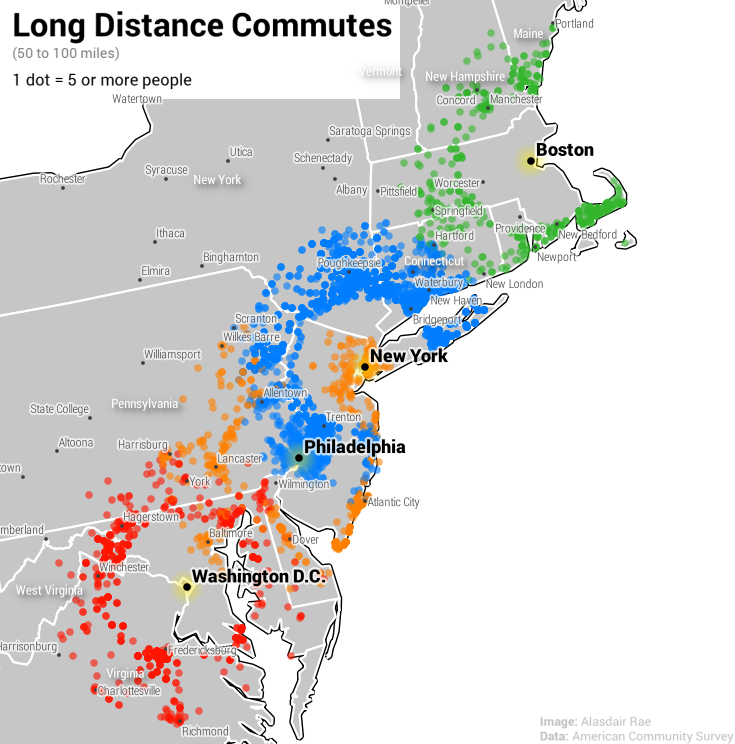 This time I decided to focus in on Boston, New York, Philadelphia and Washington, DC and look at commutes ranging from 50 to 100 miles, as there is a good bit of overlap and this fits the 'long-distance' threshold used by many, including Rapino and Fields. Hypnotised yet? If not, keep looking. 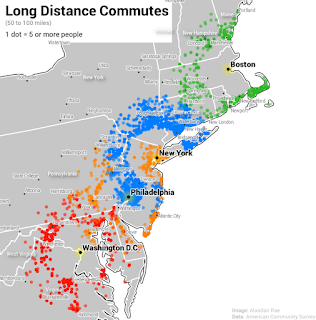 Most people, of course, don't commute these kinds of distances but I was particularly interested in the relationships over longer distances as it says a lot about the pull of individual cities. In the case of the above, it's actually the county-level I focus on (so New York County (Manhattan) for NYC, Suffolk County for Boston and so on). The animation is deliberately simplified so there are no place names for smaller settlements but you can see these on the still below. Perhaps you can even pick out your own commute. If you're really into this kind of thing, take a look at this Reddit about people who live in Philly but work in NYC. I should also say a word or two about the dots. The dots go from point to point because a) this is a simplified model of commuting flows; b) even if I did a network version I wouldn't know exactly which way people go; and c) they tell me what I need to know - where people start and where they end up. If we extend the distance out to 200 miles, using flow lines, then the patterns for Boston, New York, Philadephia and Washington, DC look like the image below, which you can see encompasses a good bit of the so-called Megalopolis. I'm going to write a proper post in future on Gottmann's original ideas, with extracts from his almost 800 page 1961 book on the subject. The precursor to the book was a 1957 paper in Economic Geography on the same topic, which I'll also come back to at a later date. In the meantime, here's a little peek at the front cover and contents page that relate to today's topic. It's interesting to note that, despite its length, Gottmann says 'it may seem bulky to the reader, but the author feels it provides just a brief summary' (p. ix). That's just about all for now. I've added in some details below about the data and software, in addition to some citations. If you're into this kind of thing and have the skills, why not take the dataset (shown for the lower 48 states below) and do something really cool with it, like an interactive map perhaps. If you're currently snowed in and have a few hours to spare then maybe this is a possibility. Data: I downloaded the original data from the US Department of Transportation website and then did a fair bit of work on it to make it useful (e.g. tidying up FIPS codes, creating the flow lines, re-projecting it etc). You can find my big final line shapefile here - it does of course include Hawaii and Alaska, unlike the example dot data shown here. Software: QGIS 2.10, GIMP 2.8. I used Michael Minn's MMQGIS plugin to create the animations and then patched them together and optimised them in GIMP, but you could do the same thing any number of ways. Gottmann, J. (1961) Megalopolis: The Urbanized Northeastern Seaboard of the United States. Cambridge, MA: MIT Press. Rae, A. 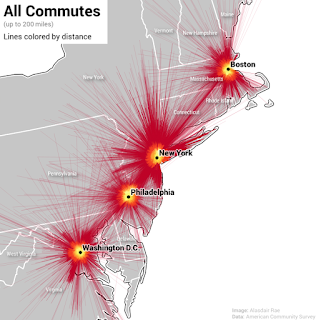 (2015) Mapping the American Commute: from mega-regions to mega commutes. Working Paper. Department of Urban Studies and Planning, University of Sheffield.